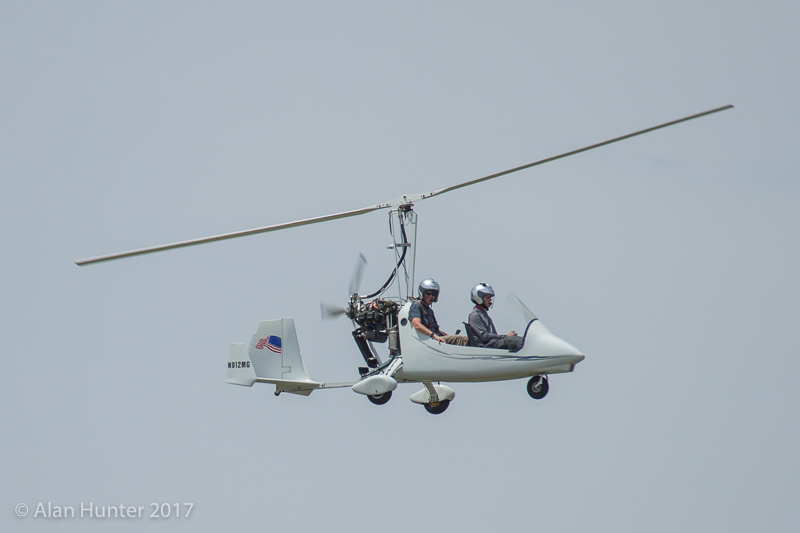 It's not every day that one gets to experience an entirely different form of flying. 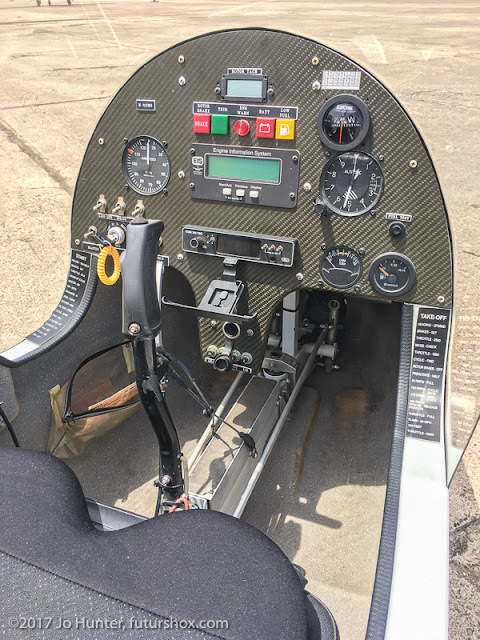 So when Facebook friend Paul agreed to take me flying in his autogyro, I was elated! We met up at San Marcos airport, where he introduced me to his aircraft. 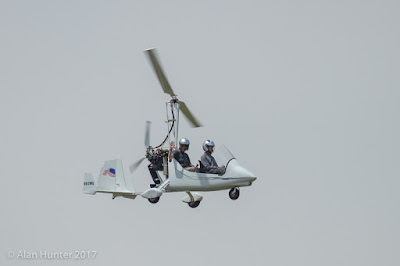 It's a Magni Gyro M-16 Tandem Trainer. This type of aircraft has one engine (a Rotax 912) which powers the propeller at the back, pushing you forward. Unlike a helicopter, the rotor is not powered, and has a fixed pitch. It's like sticking your hand out of a moving car window; your forward speed pulls the rotor through the air and provides lift. We taxied out to the runway on the propeller alone; the rotor remains fixed at this time along the length of the airframe. Once run-up chokes are complete, Paul released the rotor and applied the pre-rotator. This starts the rotor turning and gets it up to a useful speed, 200 RPM. You can hear the swish-swish-swish of the rotor blades getting faster as it spins up. There's a gauge at the top of the panel that shows the rotor RPM. 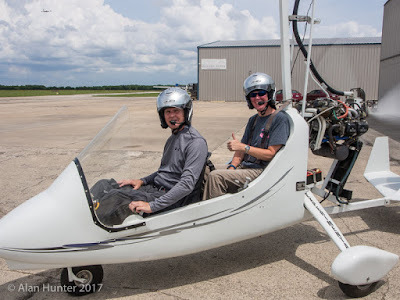 Paul began the takeoff roll and once the RPM was sufficient, (200-220 or so) he lifted us off, and we just levitated up! There's not much forward speed at this point, but the vertical ascent was impressive. The first thing Paul did was to turn towards one of the other runways that was not in use, to demonstrate an autorotation. 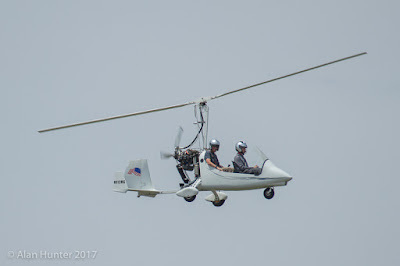 He pulled the power back from the engine and really, it's a non-event; the aircraft starts to descend in a very civilized manner, at a very manageable speed. We made a leisurely landing on the runway, then added power back in and took off again. This demonstrated nicely that if we had an engine failure, there's plenty of scope to land safely. We headed out to the east, where there are open fields, few houses, and space to play. We flew low-level over some of these fields. Lots of fun :-) Paul threw in a few turns, which are fine. I was strapped in pretty well, so even though there's very little surrounding you, it doesn't feel like you're going to fall out or anything like that. On the subject of things falling out, however, you can't have anything loose in the cockpit; no holding on to cameras or such like, because if you drop something there's a danger it could go through the propeller behind you. Since this would be a Bad Thing, this is why I have no in-flight photos. Sorry; but there it is. It's too bad since I would love to post a picture of the Blanco river here - I didn't know so many tubes existed on the river! It was a lovely day and it seemed like the people of San Marcos were out in force on the water, floating along on their brightly coloured tubes; it looked like someone sprinkled packets of Fruit Polos or Cheerios all along the river. We were cruising at around 90 mph, for the most part. 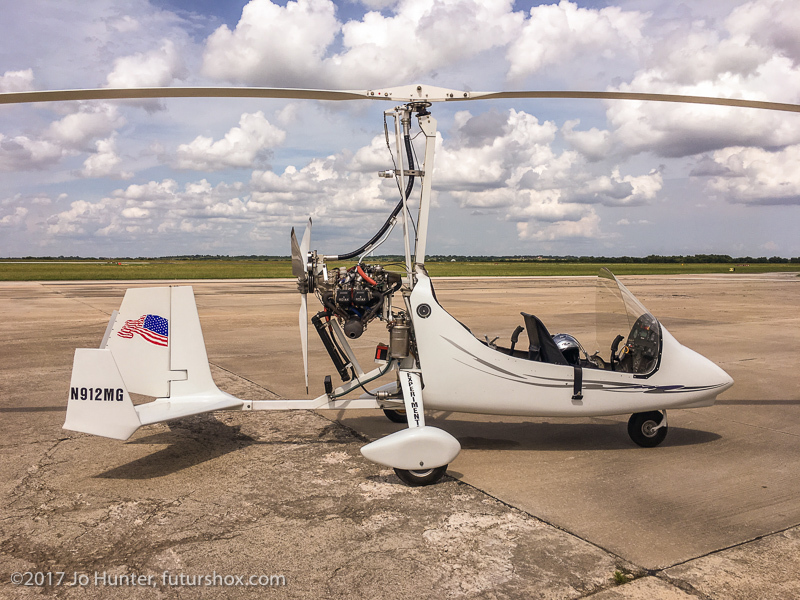 This is not a speed machine by any definition, but that's not the mission of a gyro. It is, however, very manouverable. Paul took us higher in order to demonstrate some more flight aspects. First, he brought us to halt in the sky. It's not really hovering, since without forward speed you enter autorotation and begin to descend, but you can stop above a point. To recover, just pitch nose down and gain some forward airspeed again to resume normal flying. Incidentally, in normal cruise the rotor speed seemed to be around 380-400 RPM. He also demonstrated a vertical flat spin. This is not something you want to experience in a fixed-wing aircraft by any stretch, but here it seems almost normal, if not a sensation I was used to. Stop in the sky, then just rotate it around the point as you descend. Once again, recover and resume flying. There's very little rudder required in making turns, apparently. You tip the rotor sideways to initiate a turn, and the whole aircraft weathervanes to follow the direction of travel. Paul allowed me to follow his movements on the controls, and there's very little input required in general. He says it is easy to trim and fly pretty much hands-off. We flew around some more near the river, and over a small lake in a field which had a huge swathe of water lilies. There were many birds around; I saw a few hawks below us. Not sure what a bird strike would do to a gyro; there's not much to hit but I imagine it wouldn't do the rotor or prop any good. But then, we're not going very fast, so they have plenty of time to evade us. The different terrains threw up the usual thermals and bumps in the air. They're not as pronounced in the gyro as in a fixed-wing aeroplane, but they feel a little odd. Paul said they don't hit as hard because the air just goes through the rotor. But there is a definite, momentary, tiny drop in lift which feels strange. The aircraft felt very stable in general. There is some rotor vibration; it's not horrible but it is there. And of course you're doing 90 with a helmet on; much like going fast on a motorcycle. These aviation helmets have headsets built in and seem to catch the wind a bit more than I remember from my bike helmet, although it's a long time since I wore that (and I wasn't doing 90, honest, Officer!). It is quite noisy; I was having a hard time hearing what Paul was saying, never mind ATC. So by the time we had flown a while, my ears and head were getting tired. We headed back to the airport where Paul did a couple more touch and goes, before we rejoined the pattern and landed. Over the fence speed was about 70 mph, although he held it a long time above the runway, because he could. Plop it down just before the taxiway and turn off. I think the landing rollout is about 10 feet, it stops almost instantly if you ask it to. The rotor is allowed to spin down and there's a brake to stop it completely once we got back to the parking spot. Mags off, master off, just like any other aircraft, and we're done. Many thanks to Paul for a really excellent flying experience!